It’s that time again, folks! LotRO’s Spring Festival has begun once again as of yesterday. It’s very exciting. The Spring Festival is not all that different from years previous. However, we do have some new things. We have new cosmetics, though I warn you right now, dear readers: that new robe is not flattering on anyone. You can actually obtain the Steed of the Jester (last year‘s surprise horse) if you gather enough flowers. But, this year, we also have a brand new horse! He’s a pretty guy, isn’t he? 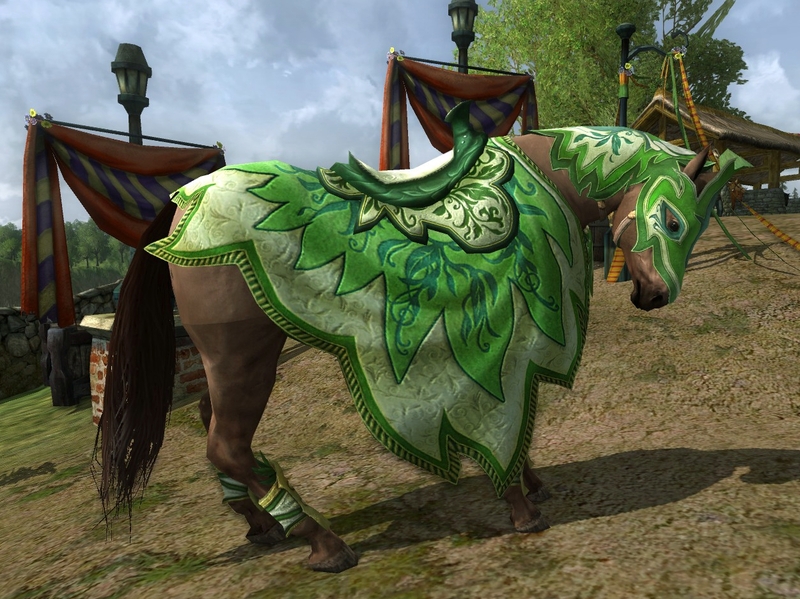 The Lissuin Steed will set you back 40 spring leaves, but, not only that, you can also buy his gear for your warsteed! Unfortunately, unlike the Yule Festival, you can’t buy a box that has all the pieces. If you want them for your warsteed, you’ll have to do a bit of shopping. The caparison and leggings can be obtained from the various Spring Festival quartermasters or at Hengstacer Farm, I believe, for 20 spring leaves apiece. The halter and saddle, however, are at the vendor in Bree near the Boar Fountain for 80/80/80 flowers apiece from that flower-picking daily. As I understand it, the cosmetics can be dyed, but as I write this, I’m not sure how they look when dyed. Unfortunately, Anthyllis is only level 49, so I definitely won’t have the opportunity to try for myself, and I’ve been scouring the internet for a picture. Unfortunately, I’ve so far turned up empty-handed, but I remain hopeful! Spring is in the air at long last in Middle-earth, for the Spring Festival has begun! A celebration of all things bright, flowering, and green! (And also a celebration where you get to stomp upon some shrews, apparently.) 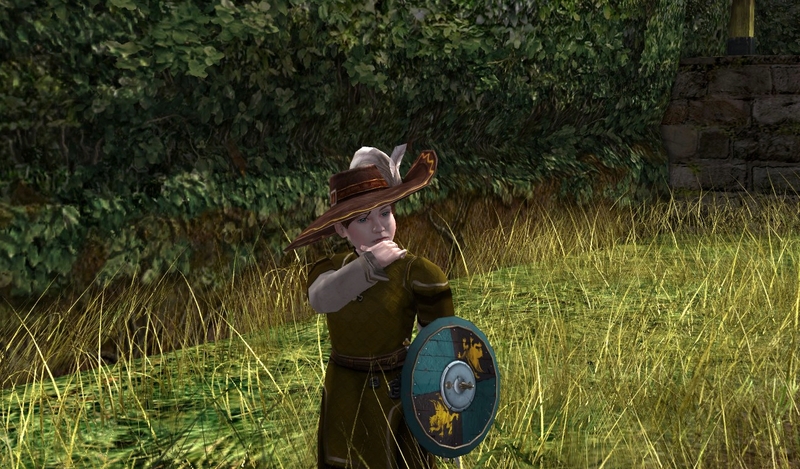 Whether you choose to gather beautiful flowers during the entire event, run around (and get lost) in the hedge maze in Bree-land, or just choose to run about and do quests to increase your reputation with the Ale Association or the Inn League, there’s something for everyone! Of course, we have our lovely festival-themed ponies, which, surprising no one, were the very things I first ran out to check. Unfortunately, ponies from previous years are locked away in the stables still, but Turbine gave us some pretty ones for this year! 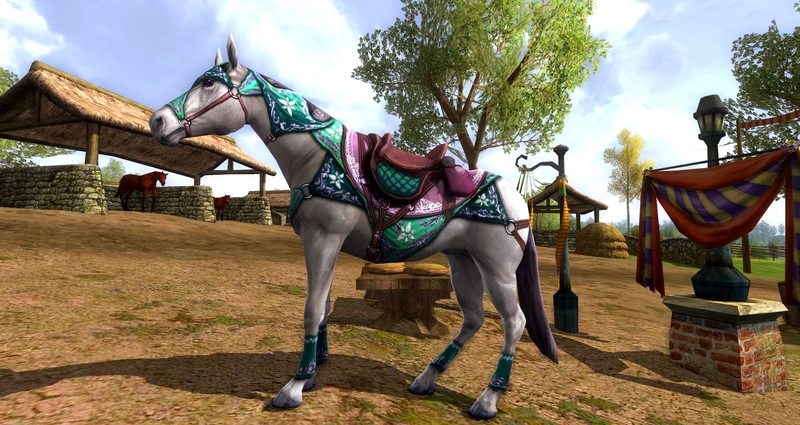 We can obtain the Springtime Steed (from last year, I believe) and the Simbelmynë Steed, though the latter requires more race tokens and leaves than the former if you’d like to add them both to your stable. The latter horse also takes it’s name from Rohan, which is fitting as we’re entering Rohan with the new expansion content. Simbelmynë (or evermind) is the name of the white flower that grows on the tombs of kings there, and it’s nice to see the white flowers on the horse’s tack in reference to this. To get these lovely mounts, however, you need to get leaves to trade! You can gather leaves through a variety of quests, and several of these quests lead you into the hedge maze out in Bree-land around Bree’s festival grounds. Unfortunately for me, I swiftly discovered that the hedge maze and I do not mix. Although the hedge maze is very pretty, I soon discovered that I felt ridiculously claustrophobic in there, and this is coming from someone who has no prior issues with claustrophobia. I basically had to flee the maze as fast as I realistically could, leaving a deed or two unfinished as a result. So, claustrophobia sufferers, beware. This may happen to you. How do I get out of here again? Sweet relief came in the form of a quest called A Fistful of Flowers, in which you basically get to run around the Shire, Ered Luin, and Bree-land, and all you have to do is pick flowers for an hour. It’s quite possibly one of the most relaxing quests I’ve ever done in any MMO. If you’re after one specific flower type, pay attention to where the quest giver tells you the flowers grow. You can pick up any of the three flower types from any flower bed, but I wound up picking a lot more marigolds out in the Shire, for example, where they are many and abundant. Once your hour for the day is up, you can spend some Turbine points to pick up another ticket in the store to grant you another hour of flower picking time, but it isn’t worth it, really. You can gather a ridiculous amount of flowers in one hour, let me tell you. I ended my flower picking a little on the early side, as I didn’t know what happened when time ran out (spoiler: nothing happens; you just complete the quest). However, in about 45 minutes, I wound up with 83 primroses, 56 marigolds, and 41 violets, to give you an idea. I wasn’t sure what these flowers were for, as I’ve never participated in the Spring Festival before, but I soon found out. Apparently, these flowers are barter items that you can exchange for gift boxes! You can get a variety of different things out of them, but the one thing I was certainly not expecting was the one thing I was the most pleased to get. Apparently, the RNG tables were making up for the fact that Anthyllis never saw a single mount out of the Anniversary festival, because I opened a gift box to reveal a Steed of the Jester within. Her name is Jangles and she makes jingling bell sounds when moving. It’s adorable. This particular pony comes with 250 health and 68% speed, a nice step up from the 62% you get with pretty much every other pony in the game. Anthyllis upon her Steed of the Jester. Unfortunately, I tend to fail a bit at guides, and there’s so much more going on for the festival that I haven’t even covered in this post. Never fear, though! A Casual Stroll to Mordor has a fantastic Spring Festival guide out as of today, detailing everything you can do during the festival, and also a nice list of some of the generic things (such as various racial dances you can earn) that occur during every major festival in the game. Do check it out, and perhaps I’ll run into you in Middle-earth!